We love flowers. We hope you enjoy sending or receiving them too, hence our slogan 'Your feelings... delivered!'. Choose from our tabs on the left of this page for our collections of Bouquets, Aquapack Hand Ties, Arrangements or Flower Baskets. 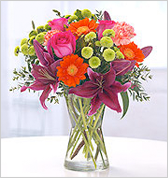 Our refrigerated Dutch flower delivery three times a week means fresh and great looking flowers. We don't send boxed flowers by courier, as some others do, as we believe it lowers the overall quality of the flowers and service. The traditional floral Bouquet consists of the finest cut stems, beautifully packaged for presentation and perfect for those who enjoy arranging their own flowers. When unpacked the stems should be cut before the flowers are placed in a vase. Aquapack Hand Ties are packed in a cellophane wrapping containing a small amount of water. Ideally the flowers should be taken out of the packaging and placed in a vase, although the water can be topped up allowing the flowers to remain in the original packaging for instant display. 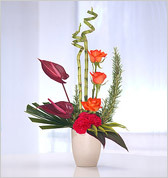 Arrangements consist of the finest cut stems, beautifully packaged for presentation in the supplied vase or container. Simply re-cut the stems and add water. 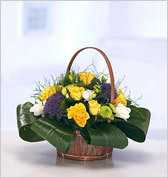 Flower Baskets are presented in a traditional style, in which flowers & foliage are arranged in floral foam base, and placed in an appropriate basket for instant display. Keep the foam moist by regularly adding water. Same day delivery is available on orders placed before 1pm. 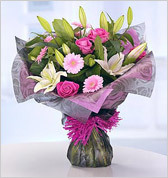 Teleflorist delivery rates apply to International orders. © Copyright Bay Tree Florists 2014. All rights reserved.